Dirty Chai Lattes are a variation on Masala Chai and espresso-based Caffe Lattes. 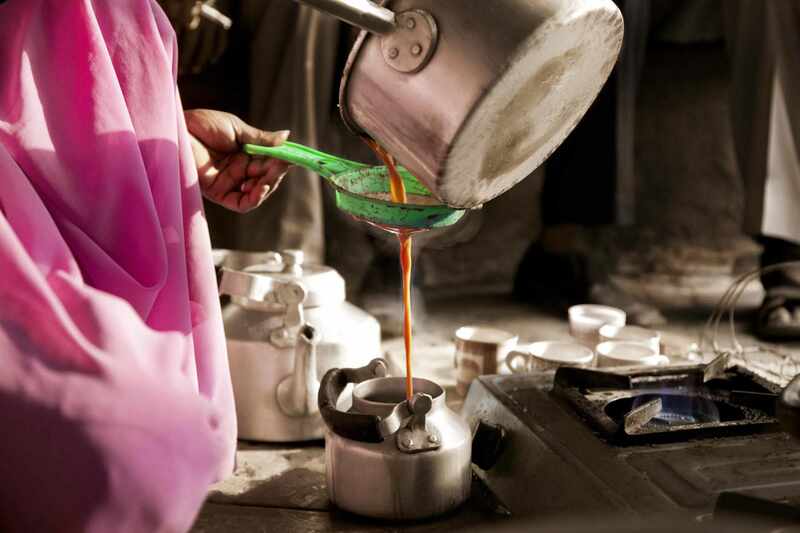 Like Masala Chai, Dirty Chai Lattes are usually made with spiced black tea. The spices most frequently used in Dirty Chai Lattes are cardamom, cinnamon, cloves, ginger and black pepper. Like Caffe Lattes, Dirty Chai Lattes contain a single shot or doppio of espresso and steamed milk. Dirty Chai Lattes have recently become a popular coffee shop drink due to their warm and appealing flavor. This step-by-step tutorial explains how to make simmered masala chai from scratch. To make masala chai into a Dirty Chai Latte, add a shot or two of pulled espresso shots into each cup, then froth with your espresso machine's steamer wand before serving. Using the iced, blended chai latte recipe linked above as a base, you can make an iced, blended Dirty Chai. Simply add a shot or a double shot of espresso to the blender when you mix all the other ingredients. For a mocha flavor, add the optional chocolate syrup into the mix. With a little shot of masala-chai-flavored simple syrup, you can transform a regular Caffe Latte into a Dirty Chai Latte. Make a Caffe Latte as the base and then add one to two teaspoons of chai syrup. Alternately, you can use a pre-made chai-flavored syrup, such as Rishi's Masala Chai Concentrate, to make a chai latte and then mix in a shot or two of espresso for a Dirty Chai Latte. This caffeine-free Chai Latte is made with rooibos, an herbal infusion also known as red tea. It is completely vegan and is sweetened with agave nectar or palm sugar. You can prepare it as a hot Dirty Chai Latte or an iced Dirty Chai Latte. Either way, simply add a shot or two of espresso just before sweetening the drink to taste. Another way to spice up a Caffe Latte is to add a Masala Chai powdered mix to your espresso shot before adding the foamed milk. You can use the chai spices above or buy a powdered chai mix, such as Jaipur Avenue's Chai Mixes or David Rio's Vanilla Chai Mix.